This is another version of the famous pork sisig which is healthier to eat compared to pork or beef specially if you are going to use the leanest part of the chicken, which is the chicken breast. In this recipe you are going to grill the chicken fillet but if you prefer to fry it, then its alright but grilling the meat compared to frying will cook it with less fat or grease. Compared to pork or beef sisig, chicken sisig requires less time in cooking. 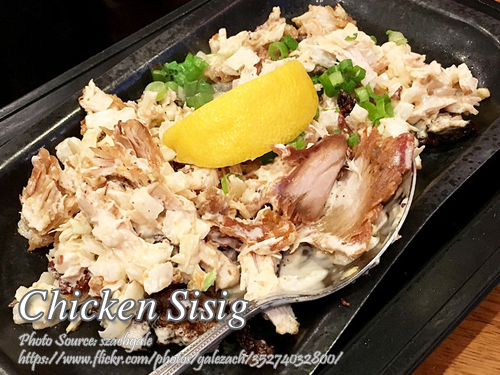 Chicken sisig is second to pork sisig in popularity because chicken is cheaper, easy to prepare and widely accepted as a meat source locally. So when you buy on food courts and food carts selling sisig (if they have other choices other than pork), you will notice pork and chicken sisig are the best sellers. If you want to make an extra effort to make your chicken sisig more appetizing, you can garnish it with chopped fried chicken skin. If you are in luck, sometimes local supermarkets sell chicken skin but they are always sold out because the fried chicken skin vendors needs a constant supply of it. Anyway just using crushed pork chicharon can replace it if you can’t find chicken skin. This is another version of the famous pork sisig which is healthier to eat compared to pork or beef specially if you are going to use the leanest part of the chicken, which is the chicken breast. Season the chicken fillet with salt and pepper. Let stand for a few minutes. Heat a non-stick stove top grill and brush about 1 tablespoon of oil. Grill the chicken fillet on both sides until cooked and brown. Chop into small chunks or cubes and set aside. Lightly salt the chicken liver and grill until brown. Chop into very small pieces and set aside. Then add the green chili peppers, soy sauce, liquid seasoning, red chili peppers and calamansi juice. Stir and cook until the ingredients are well mixed and the liquid is almost absorbed. Turn off heat then add the mayonnaise and stir well. Transfer the chicken sisig in a sizzling plate and garnish with chopped spring onions. Hi, I tried your chicken sisig and I love it! Thanks! Hi Kim, thanks for sharing your experience! Cheers!